The holidays are a time for reflection on the events of the year and what we want to accomplish for the new one. Better health is often at the top of the list of things we want to focus on. Not everyone wants to lose weight, in fact, there’s a trend away from body image shaming and placing on emphasis on getting too thin for the wrong reasons. But healthy is always in. And that includes healthy hearing and sight. If you are diabetic, you probably know that many people with this disease find out they have it because they wake up one morning and their sight is so bad they can’t see. This happens because there is so much sugar in the lenses of the eyes they almost congeal. Taking care of your sight becomes of the utmost importance from then on. I know because it happened to me. One thing I’ve encountered is the high price of glasses and frames which has made it difficult to afford to change my prescriptions as often as I should. Well, that was the case until I found out about the low prices on Zenni Optical. 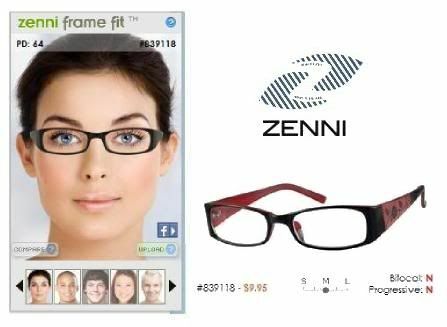 If you are concerned about the high price of prescription glasses and need to update your prescription you should try using a Groupon coupon for Zenni Optical and see how much money you can save. I was attending a wedding recently and commented on the lovely glasses one of the guest was wearing. She told me she bought them online, and that it was easy and convenient to do. She really shocked me when she said she only paid $6.95 for frames because they fit her face perfectly even though she had never tried them on. She used her prescription to order the lenses and used the Zenni online feature to see how her face would look in her new frames and voila! New lenses and frames for less. If you check out Zenni right now you’ll see great deals and saving of 10% on Active eyewear, Sophisticated eyewear, Kid’s eyewear and more. They even have freebies you can easily qualify to receive. And the online fit feature was easy to use. You just upload a photo of your face and select the frame style you want. I’m so glad I learned about Zenni Optical that day. Since then I’ve told the folks in my support group about the site and the Groupons that can save them money, and possibly save their sight, too.